Any guesses as to what I've been up to? It certainly looks a lot more dangerous than it really is. The object on the left is an electronic ambulatory infusion pump used by medics. 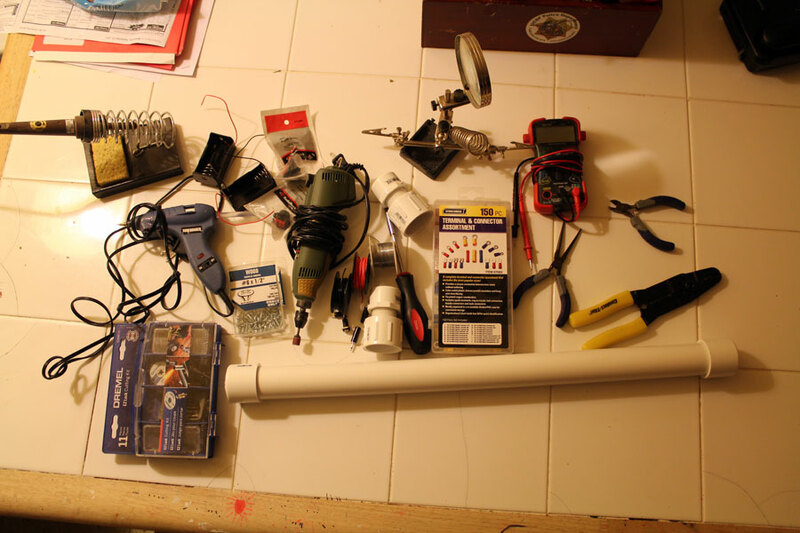 The object on the right is a makeshift battery pack I put together to power the pump. A little while ago a friend of mine came to me with a problem - he was running an in-vivo experiment using one of these pumps to provide a continuous nutrient supply; the problem was that he needed to run the pumps continuously throughout a two week experiment. The pumps only accepted AA batteries and would run out of juice after only 4 hours of use. Having to go to the lab and change batteries every four hours sounds a bit too much like experiencing the sleep debt of having a very young child... So, he asked me if there was a quick and easy way to improve the situation. Connecting the pumps directly to the mains was out of the question; they needed to remain portable and untethered. So I thought we could add an external battery pack instead which would house larger, D size, batteries to increase the available power supply. These pumps cost around $800 each, so I wanted to make the least invasive upgrade possible - yes, I'm a scaredy cat. Rather than ripping them open and soldering directly onto the circuit board, I decided to make some fake AA batteries to interface with the internal battery terminals. A couple of screws at the end of correctly sized dowels should do the trick. So, I measured an AA battery (length and diameter) and headed over to OSH to pick up some doweling (I know... I feel like I was cheating on home despot). I cut two AA sized cylinders and decided on the right length of wire. 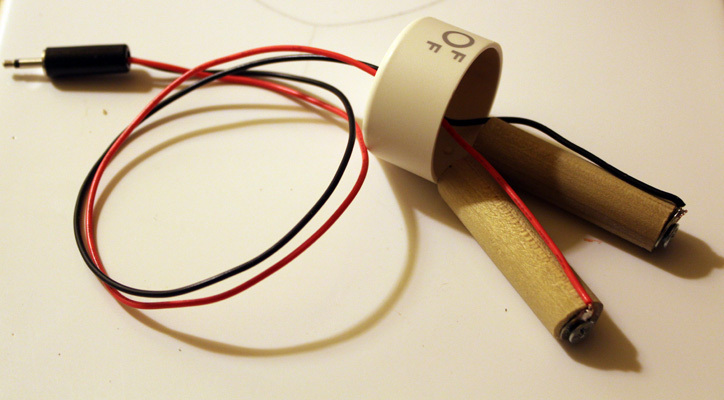 I attached the wire to the ends of the dowel using a circular crimp terminal and a couple of wood screws. I had to drill a small hole in the pump casing in order to have the wire accessible, I threaded the wire through the hole and attached a mono jack plug to the end. For some reason I have a bag of these plugs and paired sockets sitting on my workbench... I figured they'd make life easier when replacing batteries by allowing the pump and battery pack to be separated and, if needed, I could make a few packs which would allow even quicker battery replacement. If you've read any of my other posts you won't be surprised to hear that I opted for PVC pipe when making the main body of the battery packs. It turns out that D batteries fit snugly in 1 1/4" PVC piping, which is readily available in Lowe's/OSH/Home Depot. I bought some single D battery holders from RadioShack so I could cannibalize the springs (and wire). I dissected them using a proxxon (a dremmel variant gifted to Lin by my PhD buddy Claire) and glued them to a couple of PVC end caps. If you look at the picture below you can see that one of the end caps consists of two pieces where one slides onto the main body and the other screws onto that piece. I glued the spring onto the inside lip of the larger piece, drilled a hole in the smaller cap to fit the jack plug and soldered it all together. The connecting wires were passed through small holes drilled in the sides of the cap. The black tape you can see is to secure the wire that connects the lower terminal with the jack socket. I thought about passing the wire down the inside of the case, but I figured that having the wire on the outside would make it very obvious how far the wire can be stretched safely. If it was on the inside someone might pull the cap off too hard/far and damage the battery pack - not good halfway through an experiment! 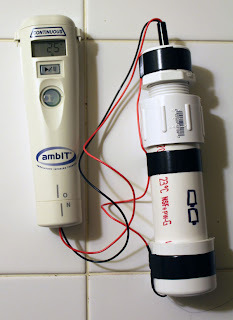 It turns out that the modified pumps and battery packs worked well. The D batteries supplied enough juice to run the pumps at full pelt for over 16 hours; Result!